A stylish end table that is versatile enough for any space, and also suitable for a unique seating option. 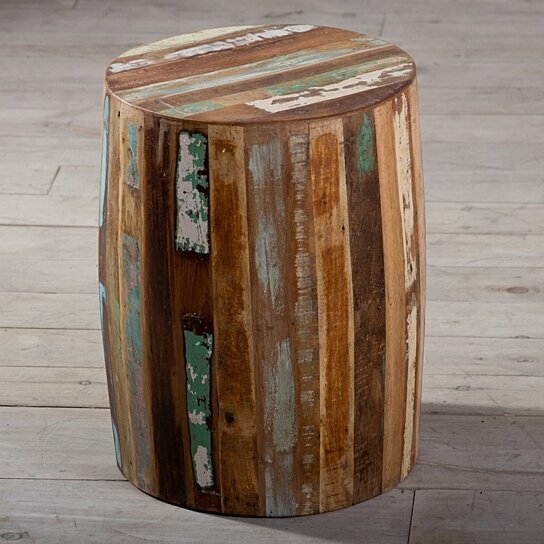 This Tanki Table is hand-crafted from salvaged wood timbers that feature paint remnants from their original use. The reclaimed teak used to hand-build our furniture originates from bridges, homes and other buildings throughout India, most dating back to the colonial era, and was salvaged prior to demolition of the structure. During the salvaging process, nails or bolts are removed from the naturally durable wood, and any large holes are patched with smaller wood pieces. Knotholes, slight cracks and indentations can be expected and do not compromise the piece's structural integrity, but rather add character to the design. Due to the construction process and materials, slight variations that enhance the piece's character should be expected.